Mark from Footloose Fishing Charters fished Thursday and Friday this week. On Thursday, they caught four from 9-10 pounds, whilte Friday they caught this 18 pounder and a couple of smaller ones. Both days in front of the Sooke Bluffs, all of the salmon were caught using anchovies. So, in our on again - off again winter spring fishing, it seems to be on once again. Sooke's weather looks a bit iffy Saturday, with some big winds tonight and continuing into tomorrow. However, Sunday is forecast to be calm. 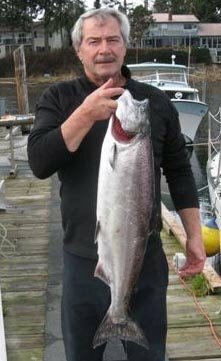 Time to get out there and enjoy some prime Vancouver Island fishing!